january - the first weeks were a blur, as i recovered from my trump-induced jaw infection. but i was better just in time to go back to the states and participate in the women's march in washington, d.c. the day after the spray-tanned satan's inauguration. sharing that experience with old friends, husband and the child was unforgettable. february - coming down from the high of the women's march. it's such a dark month in these northern latitudes, but there was a trip to the uk to do a bit of reconnaissance for later film shoots. i also gathered the girls for a much-needed drink & draw evening. since for me, it's really about the food, i made homemade ramen. yum. march - brussels for a few days, showing off our lego ship in front of the european parliament during european shipping week. a bit of quality molly time in the greenhouse. i popped down to the shipyard in germany where we were building two new ferries. i had a bit of time for creativity - making soft guns for our spring exhibition with the theme of paradox. oh, and i might have turned fifty. april - the child went to prom, the garden went in, we had rhubarb coming out of our ears, and we did a grueling three-country shoot for a video. while we were waiting, we managed some fish & chips in cleethorpe, a rather traditional little seaside english village that tasted slightly of faded glory and sadness. may - probably the most action-packed month, as you can see from the mosaic. two weeks in the us, doing major cleaning in our mother's house - there were tears and laughter (that was just spreading dad's ashes in some of his favorite places), a reunion with old greenie, dad's boat, that my sister bought back for $100, kayaking with mom and a hurried trip to a doctor to have a throat abscess drained (no photo of that, thank goodness) just in time to fly home to denmark. back home, the first kittens awaited us, along with the garden and glorious yellow canola fields. there was even time for a weekend project - painting an old chest with the wonderful annie sloan chalk paints. and i tried the fabulous gasoline grill burger for the very first time. simply the best burgers in the world, hands down. 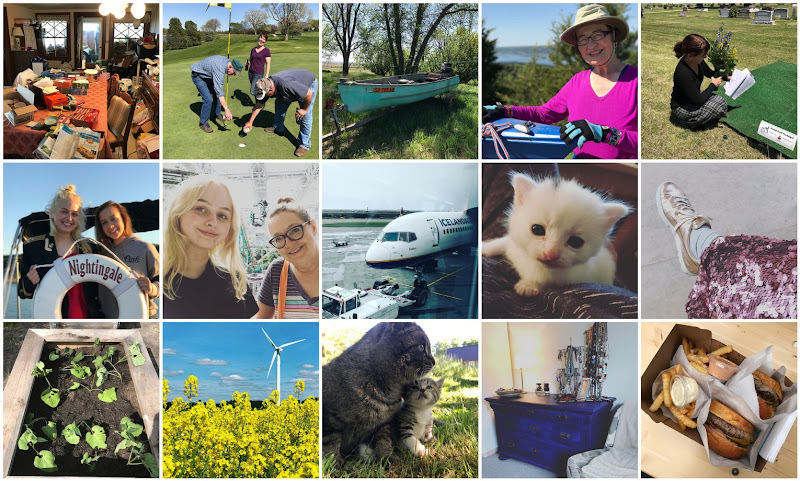 june - a yoga retreat, mark-marking, a reunion with old friends, gardening, seeing lea thau, my favorite podcaster speak at the royal library, wildflowers in the ditches, gorgeous kittens and the first meals from the garden - potatoes, strawberries, swiss chard and kale. yum! 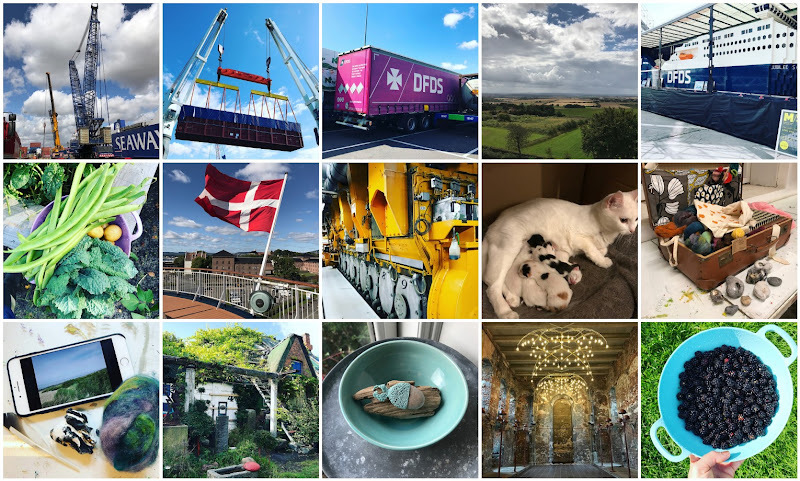 spotting some perler-bombing in copenhagen and lifting the world's largest lego ship down into the dry dock at the maritime museum of denmark. in all, pretty eventful and good. july - a holiday in lithuania - it's a hidden gem in europe, i tell you. highly recommend! 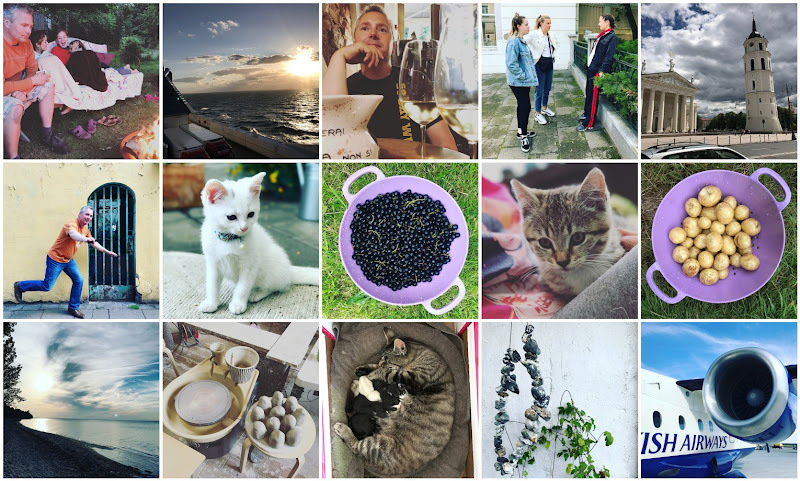 then home to berries - blackcurrants and red - and kittens growing up and more kittens being born. and a blissful three-day ceramics course with the fabulous nina lund. my hole-y rock collection grew and i found a creative way of displaying it on a rusty old piece of wire i found and there was yet another trip to film in the uk. august - filming the lifting of some seriously big objects and working with an awesome team. then back home to the garden in full swing. a kickoff trip for a new team sailing back and forth to oslo - pretty cool when you get to use your ship as a meeting room. then MORE kittens - this time, charlie had six - that was too many and so we resolved it would be her last batch. a wonderful weekend getaway with my creative friends down in højer, a new-to-me corner of denmark - it rejuvenated my soul after a rainy, cold summer. and lastly, a wonderful visit from an old friend who we met when we were in macedonia. september - bob is growing up so fast. i prepared for an exhibition of my photos at the local library. we visited hjerl hede, a museum with examples of houses through time on a rare nice late summer day. a return to the yoga mat after too long an absence. quality cat time. a trip to the beach with another lego friend. some pretty regular work in my art journal, which i took up again after the retreat at the end of august. and some autumn flowers from the garden. and rounding out the month winning a european digital award in berlin for our lego ship project. awesome, except for the 12 hours it took to drive back from berlin. october - the leaves started to fall. but there was time for some sunny days in the garden in the company of my garden kitties, molly and her granddaughter bella. the first of the amanitas. an apple tart. time spent reconnecting with old friends (and bunnies), some additions to the wardrobe, enjoying the comfort of kittens after slicing my finger on a french press that exploded in my hands and sent me to the emergency room for six stitches. more quality time with cats. and another reunion with an old friend who gave a wonderful lecture on creativity. it occurs to me that this may have been the year of reuniting with old friends! that's a rather magical realization of putting together this end-of-year look back. november - husband ran for the city council, as a member of a new party. alas, he didn't get in, but he learned a lot from the campaign and he showed that he's not just going to complain about the politics, but do something about it. there was much time spent with the best batch of kittens we've ever had - frannie outdid herself with these lovelies. but now they've all gone to their new homes and are being loved there. a tiny little project was worked on, but more about that in the new year. gemma and gretchen - it was hard parting with them, but i can't keep all the kitties. december - the darkest, rainiest, coldest month. but still there was joy - in the form of a whimsical monkey from skinny laminx, a hilarious "welcome" mat, handmade gifts to myself (earrings, a candle holder inspired by some primitive church paintings, sweet little wonky blue pots), an irresistible seasonal highlighter from chanel, learning how to make flødeboller and a lot of time spent in the center of copenhagen, working on a passion project that's also part of my job. for my christmas present, husband made great progress in the kitchen and we actually cooked out there on new year's eve! love the orla kiely wallpaper we chose for the backsplash! and just before christmas, we went out and chose a tree - bickering all the way, as per tradition. when i think about it, 2017 seemed hard - i think because of the relentless awfulness of the madman at the helm. it wasn't a year in which i slept all that well. but when i look back at it like this, in pictures (and yes, i'm still taking a daily photo, tho' most were with my iPhone this year), it was also filled with joy and laughter and pleasure - much more than i realized. i bid it farewell with more affection than i thought i would. and greet 2018 with open arms. happy new year!